Hector Bellerin has in his usual way disclosed to the public that he has returned to London Colney as a part of his rehabilitation process. 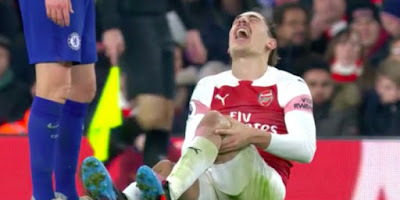 The right-back was ruled out of the season following a knee injury he sustained during the 2-0 victory of Arsenal over Chelsea back in January. It was severe to the point that he had to undergo surgery to get the anterior cruciate ligament problem fixed in Spain and ever since, he has kept on giving updates on his progress. In his Youtube video, the 24-year-old stated that he was at the club's training ground for the first time since the disaster struck. The Spaniard went on to say that tests conducted showed that he is doing fine. The physios were happy for his fast recovery. Those who followed up proceedings during our tour of Dubai in the last international break would know that activities Bellerin talked about in the above video occurred last month and not this week as some may think. However, he did not publish it until this week. He was part of the squad that made the trip to the United Arab Emirates where the lot had a five-day warm-weather training camp. Do not be overjoyed yet. Oh! You want to see him on the pitch before the campaign ends? You'll have to wait a bit longer. He has not gotten to the required fitness level yet.